Navigating the narrow aisles of his Winnipeg shop with the energy of a man half his age, Yusuf Abdulrehman pauses to point out bright spices, dark teas and pastel sweets that have travelled across the globe to reach his prairie outpost. “We don’t only sell halal meat, we have a variety of products coming from all over the world, coming from Syria, from Lebanon, Jordan, Turkey, Egypt, Morocco, Tunisia. This is why you need to be at the store to see it all, there is so much here,” he says, pointing to shelves stacked high beyond his own reach with tea sets and kitchen accessories. After directing one customer to a nearby freezer and pausing to quickly say “As-salãmu ‘alaykum” to another, Abdulrehman leads the way to a side room, pulling out a variety of well worn chairs and stools before settling in. The short-term solution for Muslims like Abdulrehman was to eat kosher products since both kosher and halal foods are pork-free, and they are slaughtered under similar conditions. But for the one-time salesman who fled political turmoil on Zanzibar with only the $20 he had sewn into his belt, the long-term solution was clear — he would open Winnipeg’s first halal store, even if it meant harvesting the animals in accordance with Islamic requirements himself. 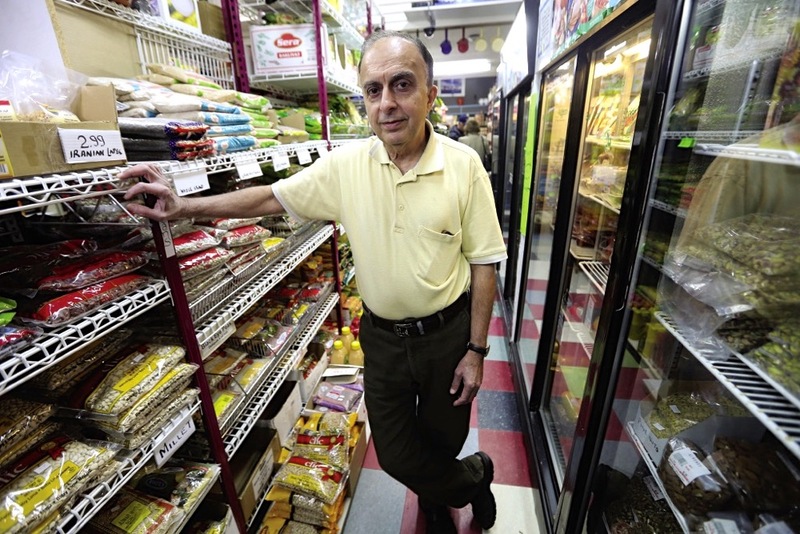 More than three decades later, Abdulrehman still slaughters most of the meat sold in his store, but he is also able to purchase halal chickens from a local supplier and he notes that mainstream food companies now produce halal products as well. Maple Leaf Foods launched Mina Halal, a line of hand-slaughtered chicken, in 2012. It was soon followed in 2013 by six value-added halal chicken products including nuggets. Sargent Farms in Ontario and Dunn-Rite in Manitoba also provide halal poultry, as do other small processors across the country. Cargill’s Dunlop facility in Ontario specializes in halal beef and SunGold Meats in Alberta specializes in halal lamb and goat. Other Canadian companies even sell halal bison and elk. According to the 2011 National Household Survey, there are more than one million Canadian Muslims, up from about 580,000 Muslims in 2001, making it the fastest-growing religion in Canada and for producers, processors and marketers, halal consumers represent a growing and largely untapped demographic. Despite increased availability of halal food in Canada, a 2014 survey found 70 per cent of halal households felt food companies were failing to meet their needs, while an additional 61 per cent of respondents felt major grocery chains fell short of expectations. The difference between Toronto, Vancouver and Montreal and places like Corner Brook or Moose Jaw is clear to consumers like Shireen Ahmed. Today the sports writer and activist lives in Toronto, but she was born in Halifax and still treks out to the family cottage on Prince Edward Island each summer, which means stocking up before she hits the road. While some stores on the East Coast do carry halal products, the mother of four says the selection is scant and prices are high. In some areas, there’s an alternative, of course, but it isn’t always convenient either. “Basically, you go to a farm in rural Nova Scotia or wherever and you literally order a whole cow and that cow is chopped up and put in your freezer. That’s how a lot of people do it in those areas, compared to, say, in Mississauga,” explains Ahmed. One place you might look is Oulton Farm, about halfway between Halifax and Wolfville, one of the few provincially inspected abattoirs offering halal slaughter on the East Coast. Thousands of kilometres west, near around Innisfail, Alta., one processor has turned to halal processing to diversify its consumer base and drive its business, only on a much larger scale. Since opening its doors in 1974, SunGold Specialty Meats has undergone many re-imaginings, but today the federally inspected lamb and goat processing plant is entirely halal, even though no one in the company’s ownership group is Muslim. “We are actually owned by livestock producers, by farmers, so our ownership is a group of Alberta livestock producers,” says SunGold’s general manager, Miles Kliner, explaining how halal was identified as an underserved market during a long-range business planning exercise. The next steps were to research halal certification agencies, form a partnership with one, and begin the move towards meeting Islamic slaughter requirements, a process SunGold completed in 2006. For most halal consumers, the term means that a healthy animal has been slaughtered by a Muslim, killed with a swift neck incision as the butcher thanks God for the animal. Pork is also forbidden under Islamic dietary law. Dhabihah (or Zabiha) is the term most often used to describe the ritual slaughter that makes meat halal, and Kliner says there isn’t a day that goes by when the SunGold website doesn’t receive a question or comment from consumers, some of which are about halal processing, wondering about how it all works and if it’s humane. The general manager assures customers it is, explaining how ancient techniques and modern practices are combined to ensure animal welfare requirements are met or exceeded. Back in Toronto, Jivraj agrees there is no reason halal isn’t compatible with modern meat processing methods. The editor of Halal Foodie recently returned from Alberta where she spoke to producers about the business possibilities halal offers the cattle industry. It’s not that captive bolts aren’t allowed, she adds, it’s that for the meat to be halal, the ritual slaughter must occur after the bolt is applied, but before animal is dead. “It’s a matter of timing,” Jivraj says. However, some questions about halal slaughter have less to do with concerns about animal welfare and more to do with anti-Muslim sentiments and far-right ideology. It doesn’t take more than a few seconds of online searching to come across racist or ignorant diatribes, posted under the guise of providing information about halal slaughter. Some of the calls Kliner receives have reflected that xenophobic sentiment. Kathy Twardek, director of consumer protection and market fairness for the Canadian Food Inspection Agency, notes that all products produced in federally inspected facilities must meet the same health and animal welfare requirements, whether they are halal or not. The agency also implemented labelling requirements last spring, requiring halal product labels to be accompanied by the name of the organization that certified the product as halal. The move has garnered a mixed reaction from consumers, with many feeling there isn’t enough oversight of the certifiers. What she’d like to see is a national accreditation agency pulled together by the religious community, but with the additional authority of government backing. Still, there’s another issue that is gaining even more priority. At Waldner’s Meats in Niverville, Man., the value that customers place on hand-slaughtered birds has been long apparent. The small, provincially inspected processor slaughters about 42,000 each year, supplying stores such as the one owned by Abdulrehman. Angela Chipilsky says they bring in a halal harvester every time they process poultry. “He comes out when we process our birds and he hand cuts and blesses every one,” she says, adding the hand processing seems especially important to their older generation of clients. Other trends are also emerging in the halal market. While earlier generations were generally only concerned about whether a product was permissible, Jivraj says Canadian-born Muslims are often searching for additional qualities, such as food that is organic or locally produced. “Especially with the millennial generation that is coming up now, they are the ones that are born here and they don’t have the same struggles as their parents did, so they are not looking for fast and easy, they are starting to look at quality,” Jivraj says. They also lack the sentimentality about the brands and products from their homeland, making tiny shops like Abdulrehman’s less alluring to second-generation Muslim Canadians. But back in his Winnipeg store, Abdulrehman isn’t concerned about declining customers or competition from the big retailers. That’s because stores like his are benefiting from yet another cultural shift. “The customers have changed, they have diversified. Now I am not only catering to the Muslim community, I am catering to the general public as well. I have more clients now that are not of the Islamic faith,” he explains. Some come for goods like carbonated yogurt drinks and spices, but they also buy halal meat. Even at chain retailers, more non-Muslims are buying halal products. A report published in Canadian Grocer Magazine notes that while 11 per cent of all meat sold in the United Kingdom is halal, Muslims only account for three per cent of the population. But while Agriculture and Agri-Food Canada puts the value of the Canadian halal market at an estimated $1 billion, a 2014 report by Thomson Reuters estimates the value of of the global halal market will reach US$1.6 trillion by 2018. It offers Canadian producers and processors a whole new set of opportunities, says Jivraj. Ron Davidson of the Canadian Meat Council suggests this could be because different countries have different halal requirements, meaning a halal processor on the Prairies might be able to export to the United Arab Emirates for example, but not to Indonesia or Malaysia, where the market is considerably larger. Smaller operations like SunGold have made inroads into the Middle East, as well as into Hong Kong. And in 2014 another Alberta-based meat processor, Prairie Halal Foods, opened its first office in Dubai. “In Dubai, where there is a lot of New Zealand lamb consumed, we service the high-end restaurants at hotels and resorts,” says Kliner, noting SunGold exports are premium, grain-finished products. Halal beef from Canada also makes it into overseas markets, with about half a dozen smaller, federally inspected plants processing it in Alberta and Ontario. But Duane Ellard of Canada Beef says the market isn’t often a priority because halal beef production is associated with an increased production cost. Still, consumption in Canada has grown three per cent in the last five years, and the organization does promote Canadian halal harvest in the Middle East, North Africa and the European Union. For those who do seek halal certification, market opportunities in Canada and abroad seem ripe. But will Canadian processors take advantage of it?